So, I have to tell the story of what happened in my neighborhood tonight. My son, Triston in particular got in BIG and I mean BIG trouble with the neighbors tonight. One neighbor came down to talk with me about what my kids had ‘done’, another neighbor spoke ‘firmly’ (her words, not mine) to Triston because of what he had done….It was a mess, people, a full-blown drama!! About a year ago, some friends of ours had a seventeen year old daughter named, Brenna that went missing. Brenna had become someone that our family had grown very close to because she was at our house often before she ran away. We all love her, but my daughter, Reese grew especially close to Brenna, and they developed a strong bond. Reese has prayed for her every day since she ran away, without fail! Well, one day recently, Reese was telling her little friend, Jenna next door how much she missed Brenna. 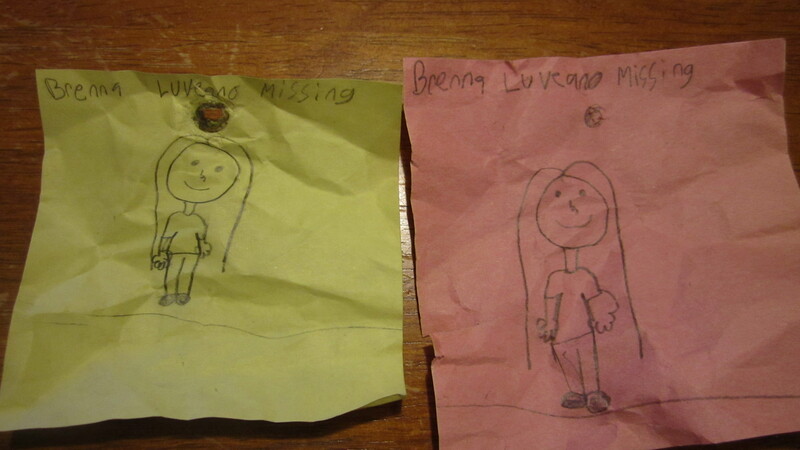 Jenna, in an effort to help Reese, created some beautiful hand-drawn missing posters (post-it note sized posters, that is) of Brenna to post throughout the neighborhood. Then, Jenna and Reese asked Triston to hang their posters up and down the street. Of course they would ask Triston, why wouldn’t they? After all, Triston has a drill! So, Triston, in an effort to help Jenna and Reese, hung several posters with his screws and drill up and down the street in the neighbor’s trees. Now, if the neighbors were home, Triston asked them, however if they were not, he proceeded to hang the signs anyway. So there is the cited crime. YIKES! As a result of my hellions, awful, and malicious crimes I went to the victims and apologized as I had Triston do as well. Phew, I’m glad that is over, we came close to bleeding trees, unlawful trespassing charges, court hearings, and a ‘possible’ over-reaction! These are the said posters, just a prop the alleged criminals used. By the way, today is a day I will remember forever. Not because of how my kids messed up, but because of how they stand out! I am in love with their hearts and their willingness to pull together and make a difference. The world needs more people like them, and the planet (and neighborhood) is better with them in it! I am so grateful that I get to be a part of their lives, even if it means I am periodically apologizing for their shenanigans! I love you Triston, Brennen and Reese, you are the coolest, just the best, I mean it! Previous Post I’m back! Did you miss me? That is awesome!! I love them sooooo much. I can’t say that I would be walking around apologizing, I would have a really hard time not to laugh at the people that were so offended. Tell them they can drill signs into my trees anytime they please!! Aunt Billy loves you guys! I am simply appalled at that dastardly child of yours Cory. Really drilling signs for missing children into helpless defensive trees no body probably even notices in the last 20 years. How dare they. You really need to get a grip on those malicious children you’ve got. This is simply a travesty!!! Tell your snooty neighbors that the boys Uncle Rick is coming to straighten this whole mess up. They (the neighbors) should get ready for some schoolen Jersey style!! One size 10 point 5 comin right-up!!! Ding!!!! lol…yes, Rick, I think a size 10 point 5 is in order! And of course Tim is out of town tonight, otherwise it may not have taken place the way it did. praying for Brenna too … I love your hooligans as well. Way to take the high road, Sis. wow, that’s crazy and tell them Nanna is so very proud of them for doing something amazing like that! as for the neighbors, wonder if their child went missing it would be a different outcome??? Love to all…..
What a way to witness to us grown ups.Obviously God is using your kids to witness to some in our neighborhood.I believe they just planted the “seed”in their lives and how they can be better people and care about bigger things than a poster on their trees.Happen to learn this values from young kids,WOW.Triston,Brennen and Reese Than you for witnessing to me and my family “I like the way you guys ROLL”Cory you and Tim are just as guilty,”shame on you”…..you “HOOLIGANS”,Hermanos en JesusCristo.Familia Luviano-Fox.